The most poignant moment in Michael Ondaatje’s Running in the Family is when he finally gets hold of the photograph of his parents taken when they were on their honeymoon. 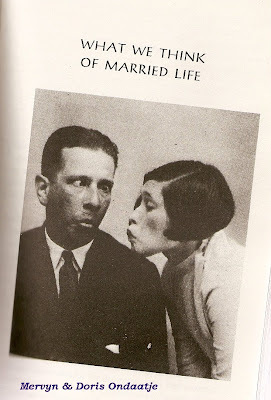 Instead of having regular, posed photographs taken the couple indulges in horseplay and prefers the unconventional. By itself this would be mildly interesting and unusual, considering that such a photograph was taken in 1932, when the tendency was to take posed pictures. What makes it a shatteringly vivid memory for the writer is that, “It is the only photograph I have found of the two of them together.” (See photograph). Despite the fact that his parents fought bitterly and divorced after 14 years of marriage, Ondaatje, who was very young when that incident happened, is forced to remember them forever at a time when they were enjoying their lives together like never before and never after. Running in the Family is an unusual book and difficult to slot into any genre. It’s a compelling and unstructured ensemble of fact, fiction, poetry, oral history, photographs and fading memories. It’s a reconstructed biography of his parents, grandparents, aunts, uncles, siblings, half-sisters; and, of course, about himself. It’s a potent brew of stories, incidents, accidents, despicable drunkenness, honourable sacrifices, loneliness and togetherness, falling in love and falling out of love, cruelty, destiny, fate and faith. It’s the story of every family that is never told and that is because most families don’t have an Ondaatje to record it. Ondaatje left Sri Lanka when he was 11 and returned twice for brief visits in 1978 and 1980 to the , the mystifying land that Ceylon was before 1983 when its peace was shattered forever as the Buddhist Sinhalese and Hindu Tamils began a civil war that has spilled over to even reach downtown Toronto. The book is lyrical, captivating and yet in a very specific way, enervating. It leaves one mysteriously sad for the writer. This is the first Ondaatje book that I’ve read. People who’ve read more than one Ondaatje tell me that his best is English Patient. "We should be careful who we pretend to be."